CANTON, Mass. , Aug. 28 /CSRwire/ - The Joy in Childhood Foundation, the charitable foundation supported by the Dunkin’ Donuts and Baskin-Robbins brands, today announced that it will deliver 10,000 custom-designed Starlight Brave Gowns to children’s hospitals during “Day of Joy” events taking place nationwide over the next few months. Designed as part of Starlight Children’s Foundation’s Brave Gown program, the Joy in Childhood Foundation’s Starlight Brave Gowns are designed to look like fun and colorful superhero costumes, inspired by the courage and bravery of pediatric patients everywhere. 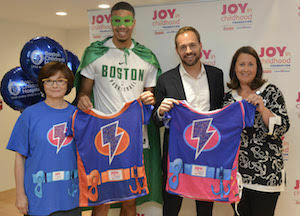 The distribution kicked off today with an event celebrating the Joy in Childhood Foundation’s first Starlight Brave Gown delivery during a “Day of Joy” at Boston Children’s Hospital.